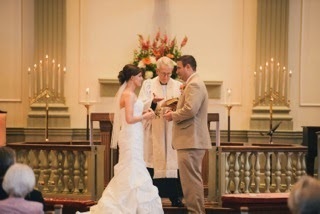 In the Episcopal Church we refer to Marriage as a sacrament. Like all sacraments it is intended to be a visible and physical representation of God's love for us. But unlike other sacraments such as Baptism and Eucharist where things reveal God's love (water, bread, wine), in marriage the love a couple demonstrates is intended to mirror the love that God has for us. 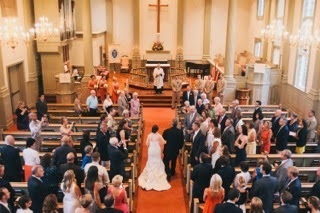 The service rite of marriage, "The Celebration and Blessing of a Marriage," can be found in the Book of Common Prayer used by the Episcopal Church. Appointed readings from the Bible can be found at The Lectionary Page. It is the policy of our church to issue wedding service priority to active members or their immediate family (son or daughter) of our congregation. An active member regularly attends worship, participates financially, and is engaged in the ministries of the church. Seating is limited to approximately 150 persons in the intimate chapel and 380 in the main church sanctuary. Church Canon law requires that every couple intending to be married by a priest of the church give at least 30 days notice. To make arrangements for a wedding at Christ Church, please contact Kathy Garber, Parish Administrator. She can answer any further questions and will schedule your appointment with the rector (priest) 330-650-4359.